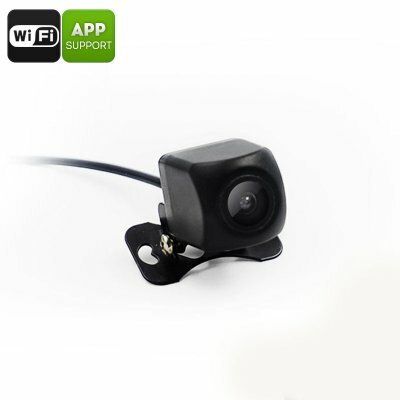 Successfully Added WiFi Rear View Parking Camera - HD Video, iOS and Android APP Support, 10m Night Vision, IP66 Waterproof to your Shopping Cart. Significantly increase your safety on the road with this state of the art WiFi parking camera. This car gadget features a very simple design which makes it easy to install in any type of car. It can be used along with your iOS or Android phone through the dedicated mobile application. When synchronized with your phone, it will allow you to watch real time footage as well as to save recording onto your smartphone for later analysis. This WiFi car camera allows you to easily see what’s happening behind your car without you needing to look over your shoulder. This WiFi car camera comes with built-in IR LED lights thanks to which you’ll be able to to use your gizmo at both day at night. With its 10m night vision support, you can always make sure that you won’t bump into something while driving your car in reverse - day or night. The camera has an IP66 waterproof design and can thus be used in any type of weather condition. With this little car gadget at your side, you’ll be able to easily park your car in reverse. Simply place it in your car, synchronize it with your smartphone, and you’re ready to go. This parking camera comes with a 12 months warranty, brought to you by the leader in electronic devices as well as wholesale car accessories..
Arabic: - سيارة كاميرا الرؤية الخلفية - Chinese Simplified: - 汽车后视摄像头 - Czech: - Auto Zpětná kamera - Danish: - Bil ede kamera - Dutch: - Auto achterzichtcamera - French: - Caméra de recul voiture - German: - Auto Rückfahrkamera - Hebrew: - המצלמה האחורית של המכונית - Hindi: - कार रियरव्यू कैमरा - Italian: - Telecamera di retromarcia auto - Japanese: - 車のバックミラー カメラ - Korean: - 자동차 사이드 카메라를 - Malay: - Kereta spion kamera - Norwegian Bokmål: - Bil Rearview Camera - Romanian: - Camera de oglinda auto - Russian: - Автомобиля камера заднего вида - Spanish: - Cámara de visión trasera coche - Thai: - รถกล้องมองหลัง - Turkish: - Araba dikiz kamera - Vietnamese: - Máy ảnh nhìn đằng sau xe.